General nature contact and knowledge based activities are often used in an attempt to engage people with nature. However the specific routes to nature connectedness have not been examined systematically, until now. Our latest research has revealed there is a need to go beyond activities that simply engage people with nature through knowledge and identification, to pathways that develop a more meaningful and emotional relationship with nature. Does being able to identify birds matter for connection? 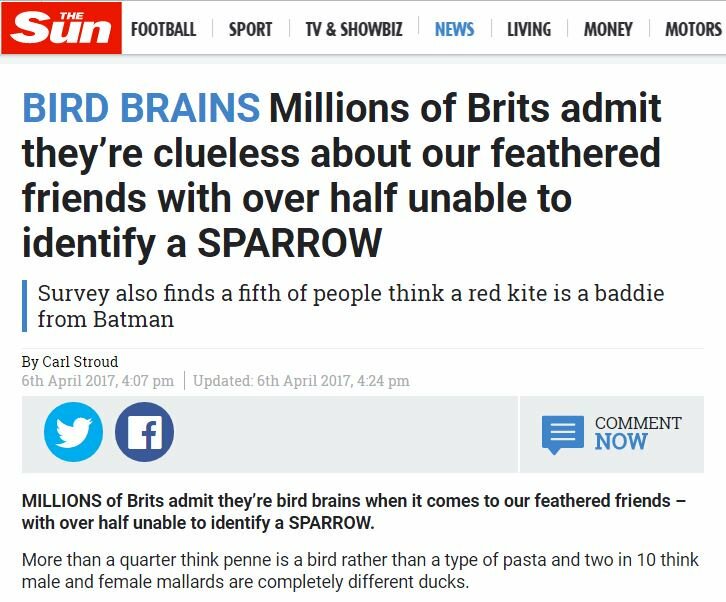 Feathered friendship is more important. The research started with two online surveys (total n = 321) of engagement with, and valuing of, nature activities structured around the nine values of the Biophila Hypothesis – this provided a useful starting point. 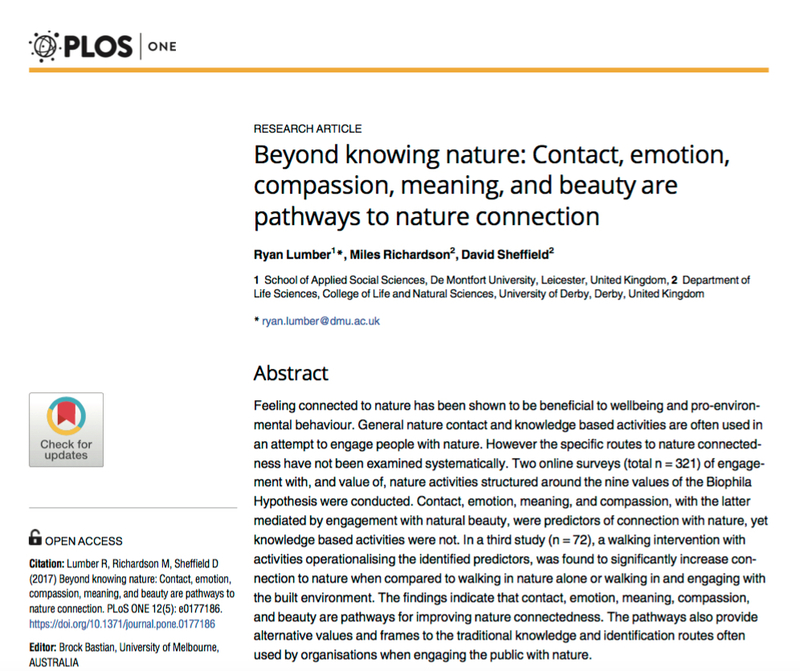 The two sets of analyses confirmed that contact, emotion, meaning and compassion, with the latter mediated by engagement with natural beauty, were predictors of connection with nature – explaining an impressive proportion of the variance in nature connectedness. Importantly, knowledge based activities, such as observing nature and increasing understanding, were not related to nature connection. Similarly, purely utilitarian (e.g. growing veg and hunting) and dominionistic activities (e.g. using natural spaces for sport) were not related to nature connection. Contact – The act of engaging with nature through the senses for pleasure e.g. listening to birdsong, smelling wild flowers, watching the sunset. Beauty – Engagement with the aesthetic qualities of nature, e.g. appreciating natural scenery or engaging with nature through the arts. Meaning – Using nature or natural symbolism (e.g. language and metaphors) to represent an idea, thinking about the meaning of nature and signs of nature, e.g. the first swallow of summer. Emotion – An emotional bond with, and love for nature e.g. talking about, and reflecting on your feelings about nature. Compassion – Extending the self to include nature, leading to a moral and ethical concern for nature e.g. making ethical product choices, being concerned with animal welfare. In a third study (n = 72), contact, emotion, meaning, compassion and engagement with natural beauty were operationalised in a walking intervention. So, the activities involved things such as having a conversation with others about their thoughts and feelings about the nature around them, writing down the meaning of any symbolism they could infer from the nature they could see, and viewing a short video about creating homes for nature. This intervention was found to significantly increase connection to nature when compared to simply walking in nature – showing simple exposure isn’t enough. Contact – get out and engage with nature. Use your senses to take a fresh look at trees, touch the bark, smell the pine needles, listen to the wind through the leaves. Meaning – consider what nature means to you. 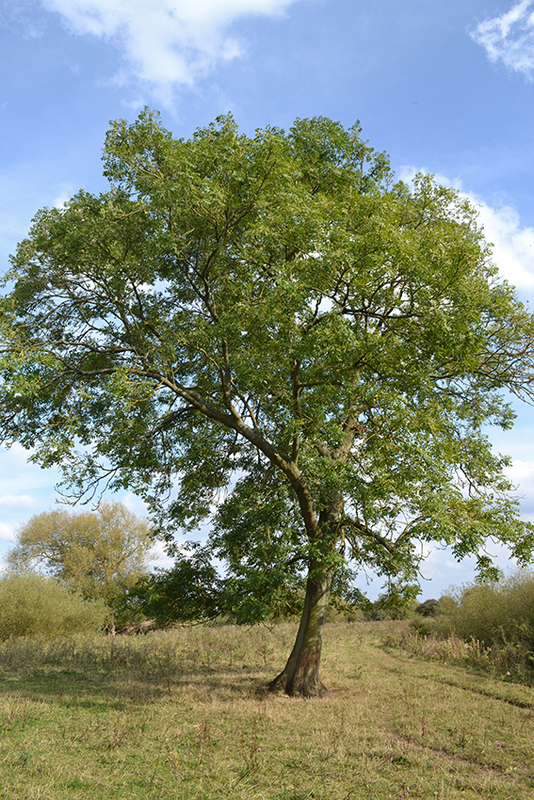 What’s your favourite local tree and why? It’s good to have meaning in our lives. Compassion – think about what you could do for nature. Why not make a home for nature? Emotion – find happiness and wonder in nature. Note the good things in nature, the joy they can bring. Beauty – take time to appreciate beauty in nature and try to capture it through art or in words. ‘Interpretation Panels’ can actually guide interpretation using the pathways. The pathways can also be interpreted to provide wider guidance. From interpretation panels to reserve and park design. 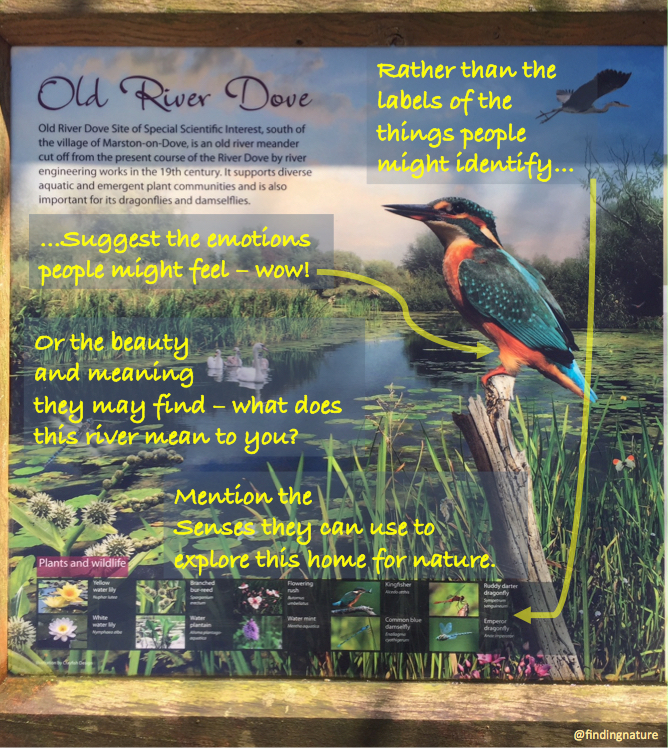 Rather than focus on the abstractions of nature, the labels of the wildlife people might identify, interpretation panels can suggest the emotions people might feel; or prompt reflection on the beauty and meaning they may find; or suggest the senses they can use to explore this home for nature. Rather than providing a place to sit, provide a place that prompts reflection – it is clear the arts has a great deal to offer in reconnecting people to nature. The pathways to nature connection can inspire design. Taken together, the three studies show that contact, emotion, meaning, compassion, and beauty are pathways for improving nature connectedness. There is a need to move beyond superficial contact with nature or focussing on knowledge and identification when fostering a relationship with nature – just because citizen science and bioblitz are great for engaging people in conservation, doesn’t mean they foster a closer connection with nature. Of course, there is no need to abandon more knowledge-based activities, an understanding of nature has great value, and such activities will be a first step into nature for some. However, the brain feels before it thinks, so if developing a meaningful connection with nature is your goal, those activities need to be widened to include some of the pathways. In summary, researchers and practitioners interested in facilitating nature connectedness and its associated benefits should ensure activities involve contact, meaning, emotion, compassion and engaging with nature’s beauty. 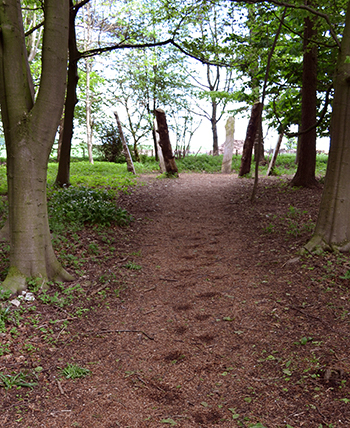 The pathways also provide alternative values and frames to the traditional knowledge and identification routes often used by organisations when engaging the public with nature. The pathways provide a framework and plenty of ways to make nature part of your life, depending on what works for you. From being out, active and in contact, to reflecting on meaning, there are many ways to make nature part of your everyday being. Once again I am reblogging an interesting post by psychologist Miles Richardson on connection with nature and well being. Particularly interesting is the research finding that factual knowledge does not necessarily correlate with emotional connection with nature. As Richardson writes, “the brain feels before it thinks”, and by focusing too much on how well species can be identified, we can miss the potential of emotional, experiential connection. I was leading a nature/landscape photography group of UK folks in Canyonlands in the USA and one afternoon I ‘made’ the participants sit and watch clouds, after several days of non-stop frantic dashing from place to place and ‘bagging’ iconic scenes. As driver/guide/host/tutor I was tired and needed a rest. The group were itchy-footed and desperate to “keep on moving” as one guest said. But I insisted we were stopping for a bit so they sat, then they got up, wandered aimlessly, sat down, got up, did more wandering then slowly gravitated towards where I was sitting watching the cloud-shadows slide across the canyons. I pointed out to a few of them the shadow’s imperceptible progress, shading a feature, then moving so the feature was sunlit with the shadow behind it, then one by one they started to notice more and more interactions of light, shade and shape and their boredom began to turn to excitement as they realised there was magic happening, but it was slow to develop and that to notice it, and to appreciate it, one had to match its glacial pace with patience. As we sat and watched I talked about light, refraction, shade, colour temperature, reflection of light and a host of other details about the ‘quality’ of light and how it could affect their consideration of a scene and its impact, through their photogrpahs, on others. Several of the group remarked that they’d never before simply sat and just watched the ‘action’ unfolding and that the hour we’d just spent had opened their eyes to the ways nature’s play of light needed to be contemplated. I had a happy group that night, and I’d got a rest! Reblogged this on Lyrebird Communications. Brillian! Im going to translate this page, into swedish and let my swedish followers take part! Thank you, i’m not suggesting abandoning knowledge based activities, rather broadening activities out beyond them. Since our paper, Otto & Pensini have found that nature connectedness explained 69% of the variance in ecological behaviour, environmental knowledge explained 2% – so it does have a role. Also, last week Hopper and colleagues found that students who were given only cultural information regarded it as a reason to protect wildlife. Those given only scientific information were less likely to agree that wildlife should be protected. There is some work related to flow type experiences and nature connection. Key is to understand them enough so guidance can be given on activities that can be used to connect people to (the rest of) nature, rather than promoting ones that might not. Thanks. Inspired by the recent work of Isham et al at the University of Surrey on flow and sustainability I am hoping to build a research project to explore this topic further in relationship to rural skills and ecocentrism. I’ll follow your work with interest.